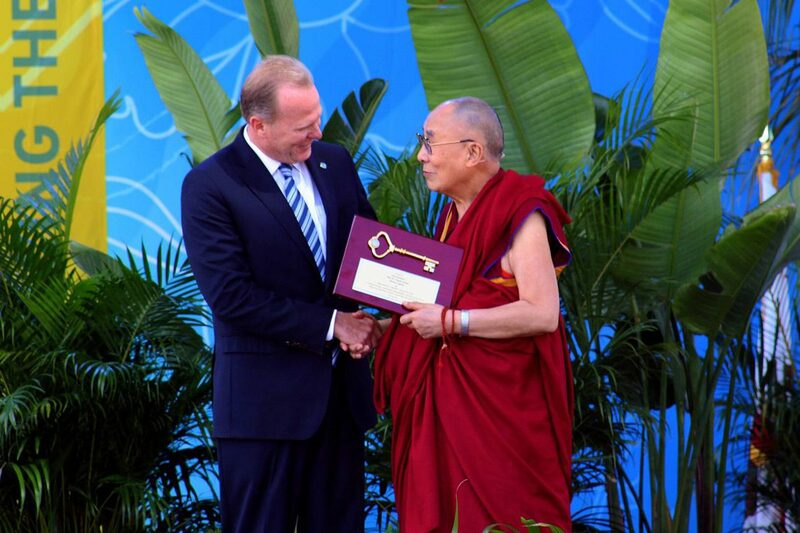 (TibetanReview.net, Jun17, 2017) – Tibet’s exiled spiritual leader, the Dalai Lama, on Jun 15 landed in San Diego city in the US state of California to a warm welcome from Mayor Kevin Faulconer and his wife as he began his 15-day visit to the US. He earlier visited the Mayo Clinic in Rochester City, Minnesota state, on Jun 13 for his routine annual medical checkup. The 50,000 tickets for his two university events in the city were snapped up within hours. The Mayor was to introduce the Tibetan leader at his public talk scheduled for Jun 16. “As a city that celebrates its diversity, spirit of collaboration and environmental leadership, we are proud to welcome one of the world’s great champions for peace and understanding to San Diego,” timesofsandiego.com Jun 15 quoted Faulconer as saying after the meeting. “His Holiness the Dalai Lama is an inspiration to people across the globe and we are honored to have him return to our city,” the mayor was further quoted as saying. As reported already, the Dalai Lama will address the university’s graduating class on Jun 17. “We are honored to host His Holiness the 14th Dalai Lama at UC San Diego and thankful that he will share messages of global compassion with our graduates and their families, as well as with a broad public audience,” nbcsandiego.com Jun 15 quoted Chancellor Pradeep K Khosla as saying in a statement. The visit to the university takes place despite strident opposition from Chinese Student and Scholar Association (CSSA), seen as a tool of the communist party Chinese government in Beijing. Some 3,500-plus Chinese citizens study on the campus, making up 12.5 percent of the student body, reported sandiegouniontribune.com Jun 15. Many were, however, reported to be open to listening to what the Dalai Lama had to say. The report said tickets for the Jun 16 address to the public and following day’s commencement speech — all 50,000 – were snapped up within hours while more than 110 journalists from Brazil, France, Japan, China and other nations sought credentials to cover the event. “This is five times as many people as we’ve ever had,” Steven Evans, supervisor of the event’s audio and video feeds, was quoted as saying. The report said that by landing a world-renowned figure for its graduation ceremonies, UC San Diego intended to make a statement about its own world-class stature. The Dalai Lama’s other schedules during the current visit include programmes in Orange County, California; a public talk on ‘Caring for the World through Kindness and Compassion’ at Minneapolis, MN, and a public talk for the Tibetan Community in Minnesota on Jun 24. And on Jun 25, he will meet scholars and attend a daylong meeting at Boston, Massachusetts.